When I was a young girl, my family attended Mt. Zion-St. Luke Lutheran Church in Oglethorpe, Georgia. The Methodist church was directly across the street from our church and most of my friends were either Baptist or Methodist, so I felt a little like an outcast sometimes at school. I loved our church though and have fond memories of growing up there. Every month we would have Family Day Dinner, when everyone would bring a dish and we would enjoy fellowship and lunch after the service. And yes, we called it dinner because that’s what it was–the evening meal was supper. Still is. Granny and Mama would usually make platters of fried chicken, deviled eggs, and pineapple sandwiches. Have you ever had a pineapple sandwich? Mayonnaise and a slice of canned pineapple on white bread. David thought I was crazy when I told him about them but we loved them! Maybe it was a rural Southern thing. We ate banana sandwiches the same way. 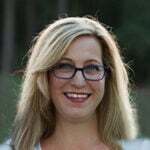 In addition to Family Day, once a year we would have Homecoming Sunday, when former pastors and friends and family who had moved away would return for this particular annual celebration. For a long time, Homecoming Sunday was held at a different location out in the country, at an old clapboard church that had been our church’s home for many years before the congregation relocated to the building in town. I was reminded of all this when I used the dish pictured above to serve these Brussels Sprouts. 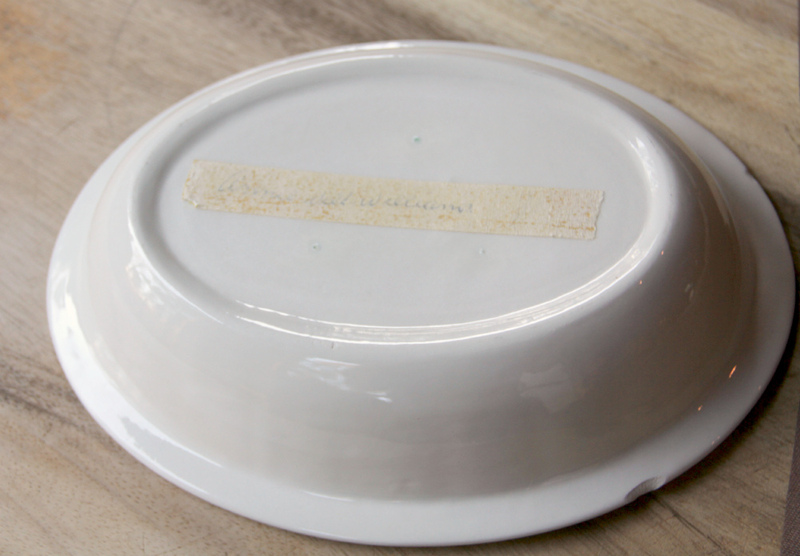 That dish belonged to my great-grandmother, Papa’s mother, and you can see the masking tape with her name that remains stuck to the bottom—this is how the church ladies identified their dishes back then. That piece of masking tape has been stuck on that dish for at least 40 years and probably longer. Here’s a photo of my great-grandmother with my mother in front, her brother to the right and their cousins in front. Below is a photograph of my Granny with Papa in the background. Not sure if this is a Family Day dinner or Homecoming but I think this would be early 80s. She would kill me if she knew I posted this photo, but she is 92 now and doesn’t own a computer so hopefully I’m safe! Incidentally, she still loves to wear red. Now, let’s talk about Brussels sprouts. 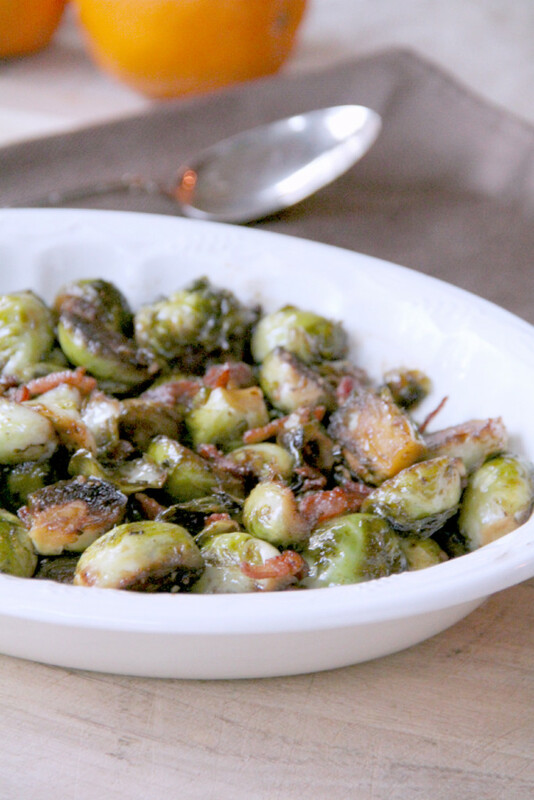 I’ve posted a recipe previously for roasted Brussels sprouts, which I love. The recipe I’m sharing today is cooked in a skillet, allowing for more even browning. Heat the oil and place each sprout cut side down, then let them cook for a bit until they are nice and browned. Then just stir them around so they don’t burn and they will get a little brown on the other side as well. Then just stir in some maple syrup and balsamic vinegar to create a glaze and you will have a flavorful side dish. Do you remember old church dinners on the grounds? Or Homecoming Sunday? Share your stories in the comments. 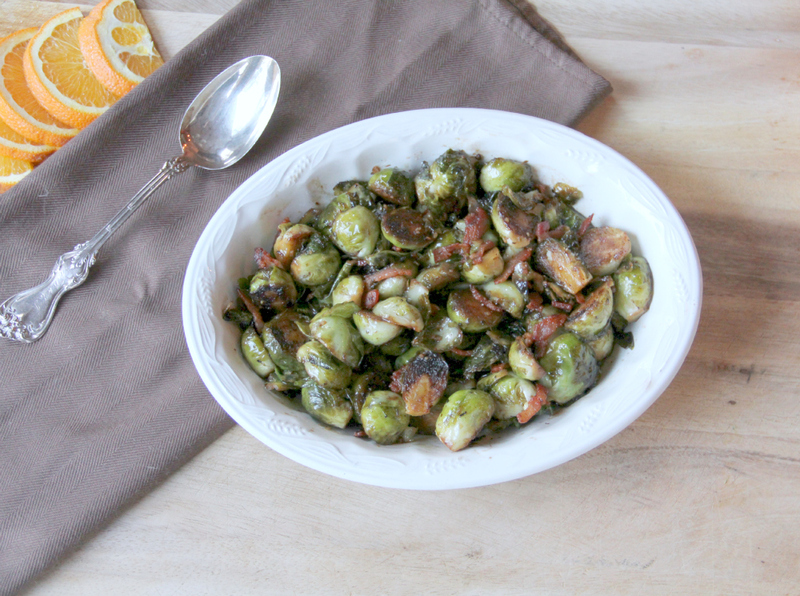 Savory sweet maple and balsamic glazed brussels sprouts with crispy bacon is a tasty side dish. Heat a large diameter skillet over medium high heat. Add oil and butter and heat 1 minute. Add sprouts, cut side down. Sprinkle salt and pepper on sprouts. Cook, shaking skillet slightly, about 3 minutes or until sprouts are browned. Reduce heat to medium and turn sprouts over. Add 1/4 cup of chicken broth to skillet and let it cook down for 3-4 minutes. Stir in garlic and cook 30 seconds. Add 1/4 cup chicken broth and cook down again. Add maple syrup and balsamic vinegar. Cook until almost completely reduced and a glaze forms. Remove sprouts from skillet and place in serving dish. Sprinkle sprouts with crispy bacon and serve.